I love French beauty products, and I love natural beauty products. Nuxe always have fantastic offers online, from voucher codes to free gifts, and I shop from them every couple of months. 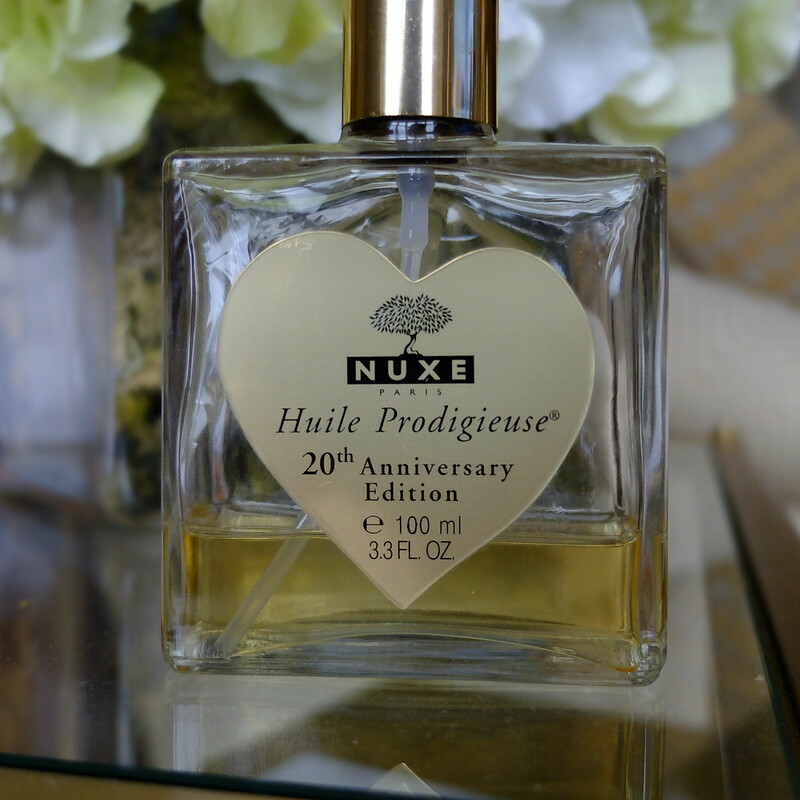 One of my all-time favourite beauty products is the Huile Prodigieuse, by Nuxe. I know people often talk about a must-have, take-to-a-desert-island product, but this one is really it, I promise you! It's one of those beauty all-rounders. A dry oil, it's non-greasy and wonderfully fragranced thanks to the six natural oils it uses. I use it as a body moisturiser mainly, either sprayed on or a few drops in the bath. I've also used it as a make-up remover, a hair-serum, a plaster-residue remover, a cuticle softener and an intense facial moisturiser. I love the scent, which to me seems very French and grown-up. There's also a D'Or version, which has a lovely golden shimmer to it. - Spray some Huile Prodigieuse® in the palm of your hand and add a drop of your usual moisturiser. Mix and apply to your skin using smoothing movements. Your face will be perfectly moisturised, and your skin softer and more supple. - Apply to your shoulders, neckline, hands, or other areas that need attention. There is nothing quite like the unique quality of Huile Prodigieuse® to enhance the skin's texture in a single step. - In the palm of your hand, mix a drop of Huile Prodigieuse® with your foundation before applying: it will glide smoothly over your skin. - Spray some Huile Prodigieuse® on a natural bristle hairbrush for naturally controlled and radiantly shiny hair. - Exposure to the sun leaves your skin feeling dehydrated and in need of special care and attention. There is nothing better than Huile Prodigieuse® to nourish and repair it. - Ideal as a massage oil, Huile Prodigieuse® glides smoothly over your skin, infusing it with its divine fragrance. - Spray some Huile Prodigieuse® directly on your hair (from a distance of around 20 cm) and massage into your hair and scalp. Then wrap your head in a warm towel and leave for 15 to 20 minutes to allow Huile Prodigieuse® to penetrate before shampooing. - Add a few drops of Huile Prodigieuse® to your bath water and drift away on its joyful and fragrant waves. - A daily massage with Huile Prodigieuse® is ideal for alleviating stretch marks. I have tried lots of Nuxe's wonderful range, and can give you my thoughts on many different products. Huile Prodigieuse is a classic product though, and if you're tempted to try the Nuxe range then start there. It's a bit of a splurge at nearly £30, but it's now a repeat purchase for me and I never travel without it. 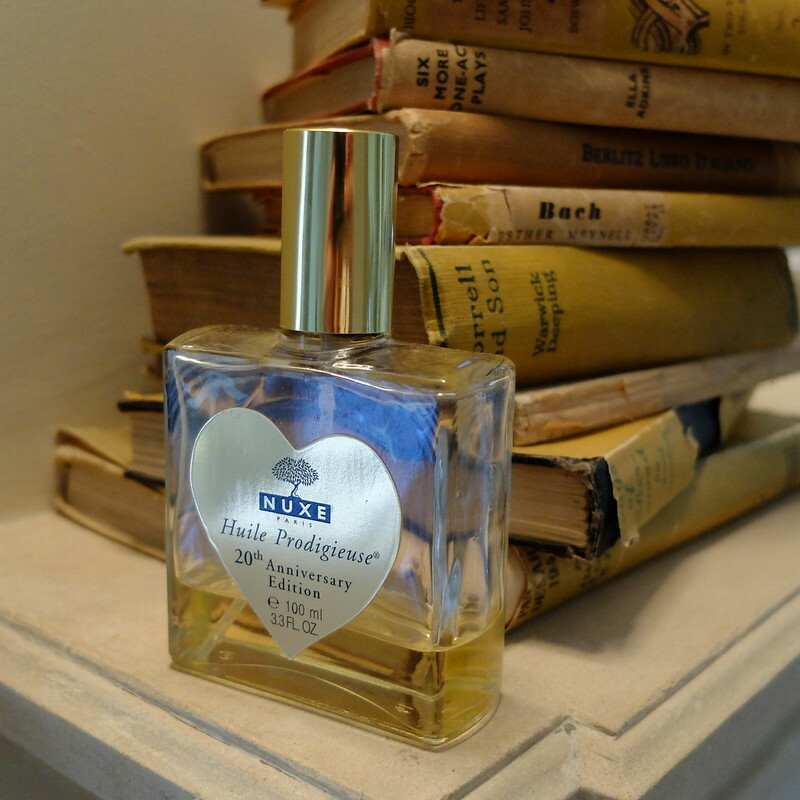 Huile Prodigieuse is RRP £28 and available online, or at Marks and Spencer. Free of mineral oil and silicone. Slightly OT thing to hone in on perhaps, but I love your stack of vintage books in the first photo. There is something that calls to me so much about crumbling dust jackets. Lovely post, my dear. Thank you for sharing your thoughts on Prodigieuse with us.